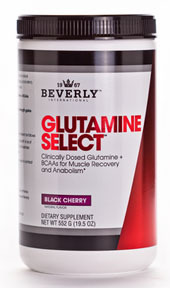 Glutamine Select with BCAAs contains glutamine, leucine, isoleucine, and valine. All are amino acids which are the building blocks of protein. The latter three are essential amino acids, which means that we must get them from our diet because our body cannot produce them. This combination of amino acids has been proven to be ideal for recovery in those who perform strenuous workouts. People who are prone to experience a lot of delayed onset muscle soreness (DOMS) can also benefit. Consistently working hard in the gym won’t happen if you are too sore to walk, sit, or get to the gym to actually exercise. When you are sleeping, your muscles are re-building and strengthening themselves, but often times your body needs more than just a full night’s rest. For the best results, it should be sipped during your workout or immediately following it. You can also mix it with your post-workout whey protein shake. Taking Muscle Provider and Glutamine Select with BCAAs together can help with increased protein synthesis. Since starting Glutamine Select with BCAAs more than six months ago, I feel like I recover faster from a strenuous workout – makes it easier to workout the next day. Probably the best endorsement I can give is that my husband, Mr. Anti-Supplement who only drinks Gatorade <shudder>, now uses the Glutamine Select faithfully. Glutamine Select has really helped me in my recovery after my workouts. When I first started working out with Sharon I had rough mornings getting out of bed (very stiff), but since I started taking it more than a year ago, I have found that I’m not having those rough mornings any more. The Glutamine Select which I take during my workouts does help me recover much quicker from those "death" sessions called MET Class. Since taking Glutamine Select for the past 6 months, I feel good during my work out and my muscles feel much better after. I would tell people to “Use this!! It works!!" When I don’t use it now, I have trouble keeping up and feel sore after. Glutamine Select is my friend!! I have been using it for over a year. I drink it during MET and after running. I can really feel a difference in how quickly my muscles recover. Also I have some knee issues and I find if I drink some Glutamine Select when it's flaring up my knee discomfort is minimized. So happy I started drinking the pink stuff!! Sharon's kool-aid! I swear by it! My initial thought on Glutamine with BCAAs is WOW! I feel great. Certainly better than the day after in any other previous week. As I increased my general activity at home and with Catalyst for Fitness, I noticed I was struggling with recovery. Sharon introduced me to the benefits of Glutamine Select. Since taking it, I find that my recovery is quicker. I have used it for beyond MET or HIIT-R recovery. After a long day in the garden of bending and standing it has assisted in recovery. When my son has overdone his workout, he takes a hit to help his recovery. I recommend this to others because it is worth the investment and benefit! Before I started taking Glutamine Select with BCAAs, my knees would sometime hurt after I exercised, now I’ve noticed it seems to help and I also don’t seem as sore after class. Right now I'm thanking you for introducing me to Glutamine Select with BCAAs. We did 200 squats during warm ups in jiu jitsu class last night so I figured I'd need a walker to get around today. I'm actually feeling pretty good.